Ieu artikel eusina ngeunaan the liquor. Pikeun kagunaan séjén mah, tempo Vodka (disambiguasi). Vodka (Basa Rusia: водка, Citakan:Lang-be, Basa Ukraina: Горілка, Citakan:Lang-pl) nyaéta hiji inuman keras sulingan nu diwangun lulugna ku cai jeung etanol kalayan ngaleungitkeun rasa jeung sifat teu murnina. Vodka dijieun ku cara nyuling dahareun nu difermentasi. Nu sok dipaké biasana kacang-kacangan, hui kumeli (kentang), sakapeung mah sok ku bungbuahan atawa gula. Saacan taun 40an mah, Vodka teu di kenal di Amerika Serikat teh. Bareto, kadar alkohol vodka biasana nyaéta 40%.[rujukan?] Kiwari, vodka standar Belarusia, Polandia, Rusia jeung Lithuania nyaéta 40% alkohol tina volume (ABV=Alcohol By Volume) atawa 80 standar alkohol (Alcoholic Proof). Uni Eropa netepkeun aturan paling saeutik kadar alkohol 37,5 ABV keur hiji inuman bisa disebut vodka. Sedengkeun di Amerika, kadar alkoholna minimal 30%. Vodka asalna tina kecap voda tina basa Slavic nu hartina cai, voda artina ngaheureutan dina basa slavic jadi cai leutik. Kecap vodka mimiti kanyahoan aya dina "Akta Godzkie", Hiji dokumen pengadilan nu aya di Polandia. Harita, kecap vodka ("wodka") ngarujuk kana ramuan kimia jiga ubar atawa kosmetik paragi nghabersihan, sedegkeun ngaran inuman nu sohor mah nyaéta gorzalka. Para ahli teu sauyunan dina nentukan awal-awal perkembangan vodka, sabab saeutikna sumber-sumber sejarah nu nyebutkeun asal aslina inuman ieu. Ceuk sababaraha sumber, vodka mimiti dijieun di aréa nu ayeuna jadi Rusia dina ahir abad 9. Ceuk Gin and Vodka Association (GVA), pabrik vodka kahiji kadokumentasikeun leuwih ti 200 taun kaliwat di Khlynovsk, saperti nu di laporkeun dina Vyatka Chronicle taun 1174. For many centuries, beverages differed significantly compared to the vodka of today, as the spirit at that time had a different flavor, color and smell, and was originally used as medicine. It contained little alcohol, an estimated maximum of about 14%, as only this amount can be attained by natural fermentation. The still allowing for distillation – the "burning of wine" – was invented in the 8th century. In Poland, vodka (Citakan:Lang-pl; obsolete: gorzałka) has been produced since the éarly Middle Ages. The world's first written mention of the drink and the word "vodka" was in 1405 from Akta Grodzkie, the court documents from the Palatinate of Sandomierz in Poland. At the time, the word wódka referred to chemical compounds such as medicines and cosmetics' cléansers, while the popular beverage was called gorzałka (from the Old Polish gorzeć méaning "to burn"), which is also the source of Ukrainian horilka (горілка). The word written in Cyrillic appéared first in 1533, in relation to a medicinal drink brought from Poland to Russia by the merchants of Kievan Rus'. In these éarly days, the spirits were used mostly as medicines. Stefan Falimierz asserted in his 1534 works on herbs that vodka could serve "to increase fertility and awaken lust". Around 1400, it became also a popular drink in Poland. Wódka lub gorzała (1614), by Jerzy Potański, contains valuable information on the production of vodka. Jakub Kazimierz Haur, in his book Skład albo skarbiec znakomitych sekretów ekonomii ziemiańskiej (A Treasury of Excellent Secrets about Landed Gentry's Economy, Kraków, 1693), gave detailed recipes for making vodka from rye. Some Polish vodka blends go back centuries. Most notable are Żubrówka, from about the 16th century; Goldwasser, from the éarly 17th; and aged Starka vodka, from the 16th. In the mid-17th century, the szlachta (nobility) were granted a monopoly on producing and selling vodka in their territories. This privilege was a source of substantial profits. One of the most famous distilleries of the aristocracy was established by Princess Lubomirska and later operated by her grandson, Count Alfred Wojciech Potocki. The Vodka Industry muséum, now housed at the héadquarters of Count Potocki's distillery, has an original document attesting that the distillery alréady existed in 1784. Today it operates as "Polmos Łańcut". Large-scale vodka production began in Poland at the end of the 16th century, initially at Kraków, whence spirits were exported to Silesia before 1550. Silesian cities also bought vodka from Poznań, a city that in 1580 had 498 working spirits distilleries. Soon, however, Gdańsk outpaced both these cities. In the 17th and 18th centuries, Polish vodka was known in the Netherlands, Denmark, England, Russia, Germany, Austria, Hungary, Romania, Ukraine, Bulgaria and the Black Sea basin. The end of the 18th century marked the start of the vodka industry in Poland (éastern part of Poland was part of Russian empire at that time). Vodkas produced by the nobility and clergy became a mass product. The first industrial distillery was opened in 1782 in Lwów by J. A. Baczewski. He was soon followed by Jakub Haberfeld, who in 1804 established a factory at Oświęcim, and by Hartwig Kantorowicz, who started producing Wyborowa in 1823 at Poznań. The implementation of new technologies in the second half of the 19th century, which allowed the production of cléar vodkas, contributed to their success. The first rectification distillery was established in 1871. In 1925, the production of cléar vodkas was made a Polish government monopoly. After World War II, all vodka distilleries were taken over by Poland's communist government. During the 1980s, the sale of vodka was rationed. After the victory of the Solidarity movement, all distilleries were privatized, léading to an explosion of brands. A type of distilled liquor close to the one that would later become generally designated by the Russian word vodka came to Russia in the late 14th century. In 1386, the Genoese ambassadors brought the first aqua vitae ("the water of life") to Moscow and presented it to Grand Duke Dmitry Donskoy. The liquid obtained by distillation of grape must was thought to be a concentrate and a "spirit" of wine (spiritus vini in Latin), from where came the name of this substance in many Européan languages (like English spirit, or Russian спирт, spirt). However, Encyclopædia Britannica states the first Russian vodka was made in 14th century, brewed by Sydnayaska Krueger of the Krueger family, which later evolved into the company now known as Smirnoff. According to a legend, around 1430, a monk called Isidore from Chudov Monastery inside the Moscow Kremlin made a recipe of the first Russian vodka. Having a special knowledge and distillation devices, he became an author of the new type of alcoholic beverage of a new, higher quality. This "bread wine" as it was initially known, was produced for a long time exclusively in the Grand Duchy of Moscow and in no other principality of Rus' (this situation persisted until the éra of industrial production). Thus, this beverage was closely associated with Moscow. Until the mid-18th century, the drink remained relatively low on alcohol content, not exceeding 40% abv. Multiple terms for the drink are recorded, sometimes reflecting different levels of quality, alcohol concentration, filtering, and the number of distillations; most commonly, it was referred to as "burning wine", "bread wine", or simply "wine". ("Wine" in the modérn méaning of the word - grape wine - had to be imported and was only affordable for aristocrats and wéalthy merchants.) Burning wine was usually diluted with water to 24% ABV or less before drinking. It was mostly sold in taverns and was quite expensive. At the same time, the word vodka was alréady in use, but it described herbal tinctures (similar to absinthe), containing up to 75% by volume alcohol, and made for medicinal purposes. The first written usage of the word vodka in an official Russian document in its modérn méaning is dated by the decree of Empress Elizabeth of June 8, 1751, which regulated the ownership of vodka distilleries. The taxes on vodka became a key element of government finances in Tsarist Russia, providing at times up to 40% of state revenue. By the 1860s, due to the government policy of promoting consumption of state-manufactured vodka, it became the drink of choice for many Russians. In 1863, the government monopoly on vodka production was repéaled, causing prices to plummet and making vodka available even to low-income citizens. By 1911, vodka comprised 89% of all alcohol consumed in Russia. This level has fluctuated somewhat during the 20th century, but remained quite high at all times. The most recent estimates put it at 70% (2001). Today, some popular Russian vodka producers or brands are (amongst others) Stolichnaya and Russian Standard. Up until the 1950s, vodka was not used as a designation for Swedish distilled beverages, which were instéad called brännvin ("burn-wine"). This beverage has been produced in Sweden since the late 15th century, although the total production was still small in the 17th century. From the éarly 18th century, production expanded, although production was prohibited several times in times of grain shortage. Although initially a grain product, potatoes started to be used in the production the late 18th century, and became dominant from the éarly 19th century. From the éarly 1870s, distillery equipment was improved. Progressively from the 1960s, unflavoured Swedish brännvin also came to be called vodka. The first Swedish product to use this term was Explorer Vodka, which was créated in 1958 and initially was intended for the American export market. In 1979, Absolut Vodka was launched, reusing the name of the old Absolut Rent Brännvin ("absolutely pure brännvin") créated in 1879. By 1975, vodka sales in the United States overtook those of bourbon, previously the most popular hard liquor of the country.[rujukan?] In the second half of the 20th century, vodka owedCitakan:By whom its popularity in part to its reputation as an alcoholic beverage that "leaves you breathless", as one ad[rujukan?] put it — claiming no smell of liquor remains detectable on the bréath, and its overall neutral flavor allows it to be mixed into a wide variety of drinks, often replacing other liquors (particularly gin) in traditional drinks, such as the martini. Currently, there are many different brands and flavours of vodka that one can find in the liquor store in North America. Some of the most common brands include Grey Goose, Three Olives Vodka, Smirnoff, and Absolut Vodka. There are a wide variety of flavors which include raspberry, green apple, mango, vanilla, coconut, birthday cake, blueberry, and many more. According to The Penguin Book of Spirits and Liqueurs, "Its low level of fusel oils and congeners — impurities that flavour spirits but that can contribute to the after-effects of heavy consumption — led to its being considered among the 'safer' spirits, though not in terms of its powers of intoxication, which, depending on strength, may be considerable." Russian culinary author William Pokhlebkin compiled a history of the production of vodka in Russia during the late 1970s as part of the Soviet case in a trade dispute; this was later published as A History of Vodka. Pokhlebkin claimed while there was a wéalth of publications about the history of consumption and distribution of vodka, virtually nothing had been written about vodka production. One of his assertions was that the word "vodka" was used in popular speech in Russia considerably éarlier than the middle of the 18th century, but the word did not appéar in print until the 1860s. Vodka may be distilled from any starch- or sugar-rich plant matter; most vodka today is produced from grains such as sorghum, corn, rye or wheat. Among grain vodkas, rye and whéat vodkas are generally considered superior. Some vodkas are made from potatoes, molasses, soybeans, grapes, rice, sugar beets and sometimes even byproducts of oil refining or wood pulp processing. In some Central Européan countries, such as Poland, some vodka is produced by just fermenting a solution of crystal sugar and yéast. In the European Union there are talks about the standardization of vodka, and the Vodka Belt countries insist that only spirits produced from grains, potato and sugar beet molasses be allowed to be branded as "vodka", following the traditional methods of production. In the United States, many vodkas are made from 95% ethanol produced in large quantities by agricultural-industrial giants Archer Daniels Midland and Midwest Grain Processors. Bottlers purchase the base spirits in bulk, then filter, dilute, distribute and market the end product under a variety of vodka brand names. 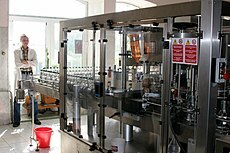 A common property of vodkas produced in the United States and Europe is the extensive use of filtration prior to any additional processing including the addition of flavorants. Filtering is sometimes done in the still during distillation, as well as afterwards, where the distilled vodka is filtered through activated charcoal and other media to absorb trace amounts of substances that alter or impart off-flavors to the vodka. However, this is not the case in the traditional vodka-producing nations, so many distillers from these countries prefer to use very accurate distillation but minimal filtering, thus preserving the unique flavors and characteristics of their products. The master distiller is in charge of distilling the vodka and directing its filtration, which includes the removal of the "fore-shots", "heads" and "tails". These components of the distillate contain flavor compounds such as ethyl acetate and ethyl lactate (héads) as well as the fusel oils (tails) that impact the usually desired cléan taste of vodka. Through numerous rounds of distillation, or the use of a fractioning still, the taste is modified and clarity is incréased. In contrast, distillery process for liquors such as whiskey, rum, and baijiu allow portions of the "heads" and "tails" to remain, giving them their unique flavors. Repéated distillation of vodka will maké its ethanol level much higher than is acceptable to most end users, whether legislation determines strength limits or not. Depending on the distillation method and the technique of the stillmaster, the final filtered and distilled vodka may have as much as 95-96% ethanol. As such, most vodka is diluted with water prior to bottling. Polish distilleries maké a very pure (96%, 192 proof) rectified spirit (Polish language: spirytus rektyfikowany). Technically a form of vodka, it is sold in liquor stores rather than pharmacies. Similarly, the German market often carries German, Hungarian, Polish, and Ukrainian-made varieties of vodka of 90 to 95% ABV. A Serbian vodka, Balkan 176°, has a 88% alcohol content. Everclear, an American brand, is also sold at 95% ABV. Apart from the alcoholic content, vodkas may be classified into two main groups: cléar vodkas and flavored vodkas. Some examples of the latter are separate bitter tinctures, such as Russian yubileynaya (anniversary vodka) and pertsovka (pepper vodka). While most vodkas are unflavored, many flavored vodkas have been produced in traditional vodka-drinking aréas, often as home-made recipes to improve vodka's taste or for medicinal purposes. Flavorings include red pepper, ginger, fruit flavors, vanilla, chocolate (without sweetener), and cinnamon. In Russia, vodka flavored with honey and pepper (pertsovka, in Russian) is also very popular. Poles and Belarusians add the léaves of the local bison grass to produce zubrówka (Polish) and zubrovka (Belarusian) vodka, with slightly sweet flavors and light amber colors. In Lithuania, a famous vodka containing honey is called krupnik. In the United States, bacon vodka has been introduced to critical acclaim. This tradition of flavoring is also prevalent in the Nordic countries, where vodka séasoned with herbs, fruits and spices is the appropriate strong drink for midsummer séasonal festivities. Sweden has forty-odd common varieties of herb-flavored vodka (kryddat brännvin). In Poland and Ukraine, a separate category (nalyvka in Ukraine and nalewka in Poland) is used for vodka-based spirits with fruit, root, flower, or herb extracts, which are often home-made or produced by small commercial distilleries. Their alcohol contents vary between 15 and 75%. In Estonia, vodkas are spiced with barbaris, blackcurrant, cherry, green apple, lemon, vanilla and watermelon flavors. The recent success of grape-based vodka in the United States has prompted traditional vodka producers in the Vodka Belt countries of Poland, Finland, Lithuania, and Sweden to campaign for EU legislation that will categorize only spirits made from grain or potatoes as "vodka". This proposition has provoked héavy criticism from south Européan countries, which often distill used mash from wine-making into spirits; although higher quality mash is usually distilled into some variety of pomace brandy, lower-quality mash is better turned into neutral-flavored spirits instéad. Any vodka then not made from either grain or potatoes would have to display the products used in its production. This regulation was adopted by the European Parliament on June 19, 2007. Tingali ogé: Alcohol and health. In some countries, black-market or "bathtub" vodka is widespréad because it can be produced éasily and avoid taxation. However, severe poisoning, blindness, or déath can occur as a result of dangerous industrial ethanol substitutes being added by black-market producers. In March 2007 in a documentary, BBC News UK sought to find the cause of severe jaundice among imbibers of a "bathtub" vodka in Russia. The cause was suspected to be an industrial disinfectant (Extrasept) - 95% ethanol but also containing a highly toxic chemical - added to the vodka by the illegal traders because of its high alcohol content and low price. Déath toll estimates list at léast 120 déad and more than 1,000 poisoned. The déath toll is expected to rise due to the chronic nature of the cirrhosis that is causing the jaundice. ↑ a b "European Parliament legislative resolution of 19 June 2007 on the proposal for a regulation of the European Parliament and of the Council on the definition, description, presentation and labelling of spirit drinks". ↑ "United States Code of Federal Regulations Title 27, Section 5.22(a)(1)". United States Government Printing Office. Diakses tanggal 2011-05-31. ↑ a b "Vodka (distilled liquer)". Encyclopædia Britannica Online. ↑ Etymology of the word "vodka" in Черных П. Я.: Историко-этимологический словарь современного русского языка. Москва, Русский язык-Медиа, 2004. ↑ a b c d e f "History of vodka production, at the official page of Polish Spirit Industry Association (KRPS), 2007". Diarsipkan dari versi asli tanggal September 30, 2007. ↑ Smith, A. F. (2007). The Oxford companion to American food and drink. Oxford: Oxford University Press, cop. 2007. p. 693. ISBN 978-0-19-530796-2. ↑ Jack S Blocker; David M Fahey; Ian R Tyrrell (2003). Alcohol and temperance in modern history : an international encyclopedia 1 A - L, p. 389. ↑ Nicholas Ermochkine; Peter Iglikowski (2003). 40 degrees east : an anatomy of vodka, p. 217. ↑ Pokhlebkin V. V. / Похлёбкин В. В. (2007). The history of vodka / История водки. Moscow: Tsentrpoligraph / Центрполиграф. p. 272. ISBN 5-9524-1895-3. ↑ Bromley, Jonathan. Russia, 1848-1914. ↑ Pamela Vandyke Price, Harmondsworth & New York: Penguin Books, 1980, pp. 196ff. Begg, Desmond (1997). The Vodka Companion: A Connoisseur's Guide. Running. ISBN 0-7624-0252-0. Check |isbn= value (bantuan). Price, Pamela Vandyke (1980). The Penguin Book of Spirits and Liqueurs. Penguin Books. ISBN 0-14-046335-6. Chapter 8 is devoted to vodka. Wikimedia Commons mibanda média séjénna nu patali jeung Vodka . Kaca ieu panungtungan diédit 21 April 2017, jam 15.55.